Our rich geological and glacial history is ever present in the British landscape today. Glaciers have left a legacy of rugged mountains with steep cliffs and narrow ridges. It is not, however, only in the mountains that we find evidence of glaciers as the eroded materials are transported through ice and meltwater before being deposited at lower altitudes. Technically we are living in an ‘Ice Age’ as permanent ice covers our polar regions. This latest Ice Age began 2.6 million years ago which geologists call the Quaternary Period. Over this time glaciers have expanded and retreated many times the most recent glaciers reached a peak around 20,000 years ago. In the British Isles the ice reached as far south as the Midlands and South Wales, the English Channel would have been dry with sea levels about 120m lower than today. Features we can recognize in a glacial landscape are either erosional or depositional. Glaciers erode by abrading and plucking rocks and depositional features contain the eroded rocks and fragments that have been carried in the ice or meltwater channels. 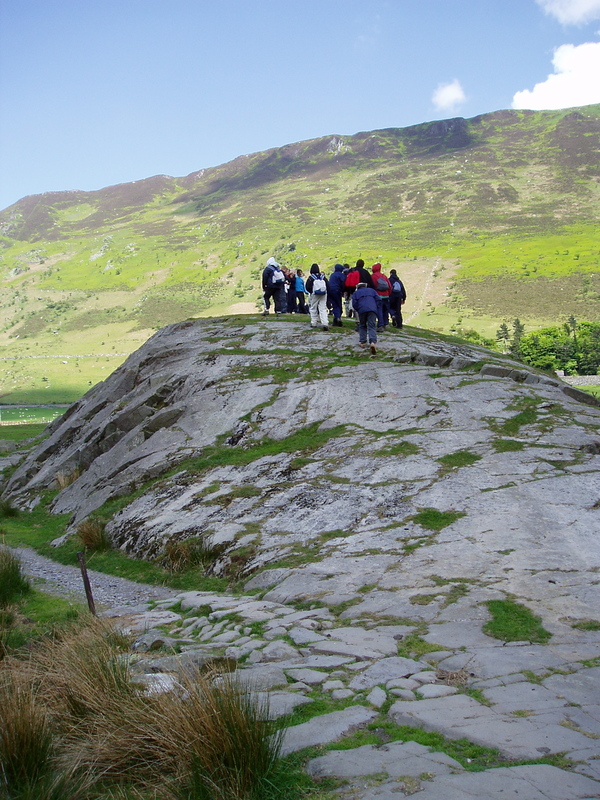 An amphitheatre-like landform formed as a result of alpine glaciers eroding the mountainside. As the glacier retreats the depression is typically surrounded on three sides by steep cliffs. 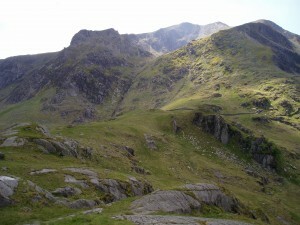 The fourth side is the ‘rock lip’ at which the glacier flowed away from the mountain. 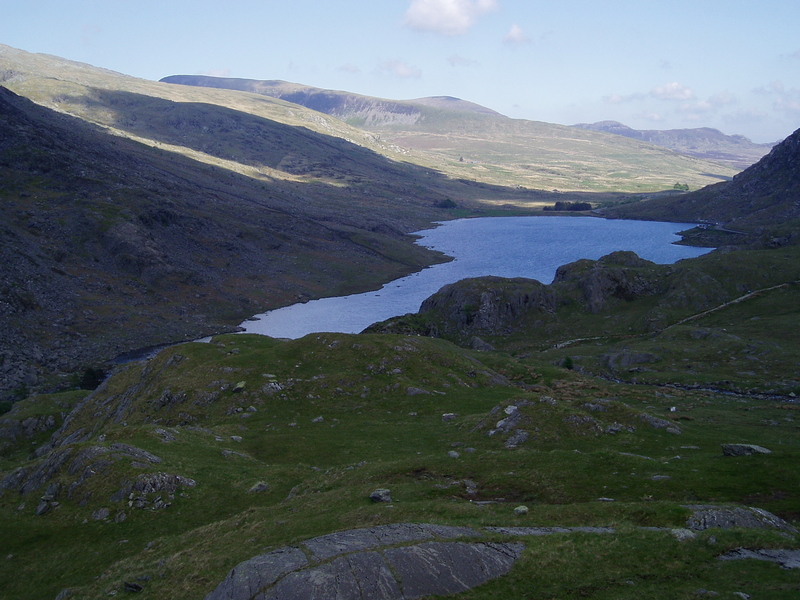 Many cwms contain lakes dammed by the rock lip that act like a dam. An arête is a knife-like ridge which is typically formed when two glaciers erode parallel U-shaped valleys. 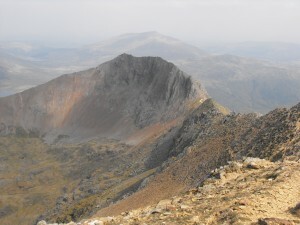 The arête is a thin ridge of rock that is left separating the two valleys. Arêtes can also form when two glacial cwms erode back-to-back. The edge is then sharpened by freeze-thaw weathering. The word ‘arête’ is French for fishbone. The shape left after a valley has been overdeepened by a glacier. 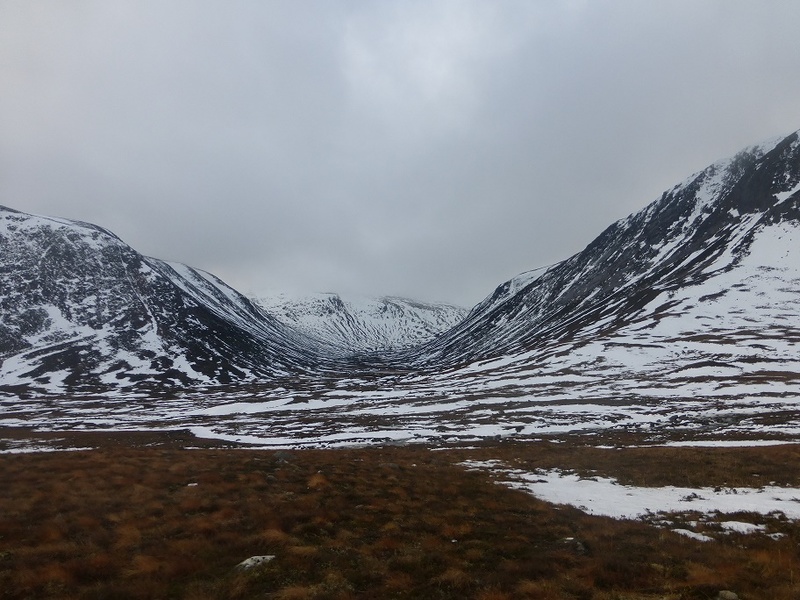 The original valley with interlocking spurs, created by a river, is widened and deepened as the ice erodes the sides and bottom of the valley. U-shaped valleys have a wide flat floor and may contain ribbon lakes and a mis-fit stream (because it is too small to have made the valley). 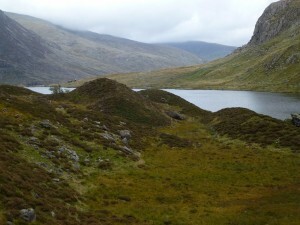 A ribbon lake is usually found filling the bottom of a U-shaped valley. Its formation begins when a glacier moves over an area of alternating harder and softer rock. The glacier moving along the valley over deepens the softer rock. The harder, more resistant rocks rise above the depression acting as dams between which rainwater filled up the basin as the glacier retreated creating the ribbon lake. Located on the sides of U-shaped valleys hanging valleys are left high on the side of a main valley that has been deepened by a glacier. Streams flowing from a hanging valley may form a waterfall as they flow down the steepened valley sides. A tear-drop shaped rock created by the action of a passing glacier. 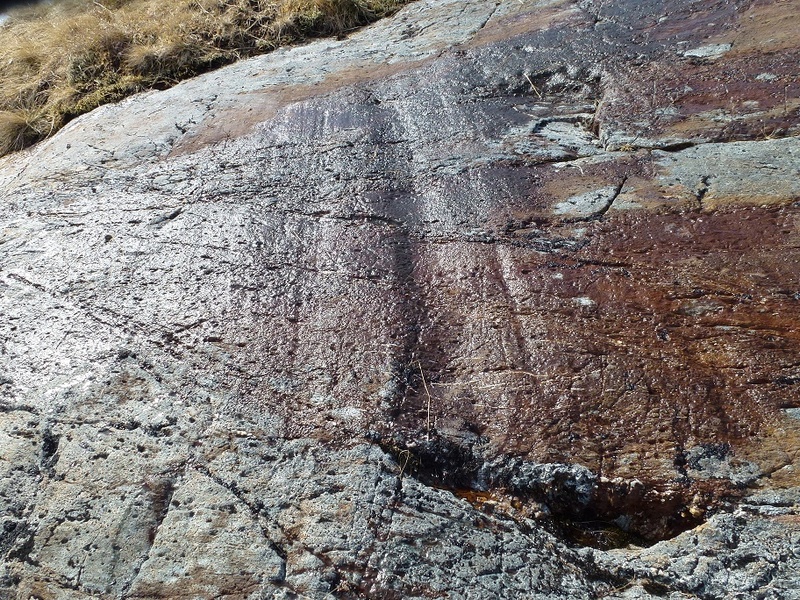 The up-ice (Stoss) side has been smoothed by rock debris as ice, melted by pressure, aids abrasion of the surface. The rough and craggy down-ice (Lee) side is created as the water refreezes on passing the rock obstacle and the rock becomes attached to the glacier which is plucked away. A series of parallel furrows in an exposed rock surface on the bottom or side of a valley. 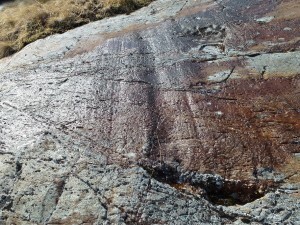 These markings indicate a the direction of a passing glacier having dragged rocks which scratched into the surface of the weaker rock. A glacially formed deposit comprising of rock debris ranging in size from silt to large boulders. 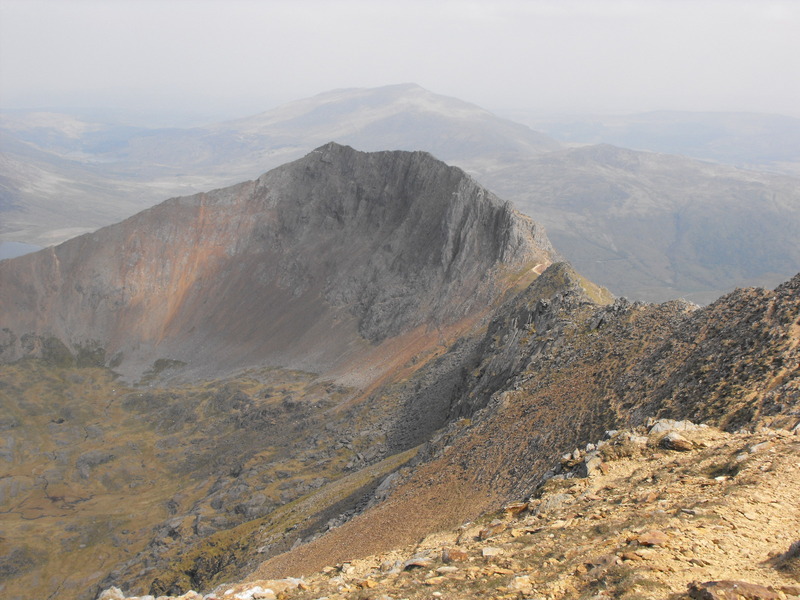 The origin of the material may have been plucked from the mountain several miles away. The debris is typically sub-angular to rounded in shape depending on how it has been transported and the distance its been carried. A deposit of unsorted glacial sediment. 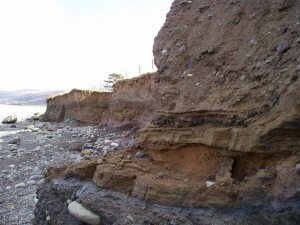 An old name for till is Boulder clay which is a useful descriptive term. Till is the generic name for sediment in a number of glacial deposits such as moraine and lake varves. . 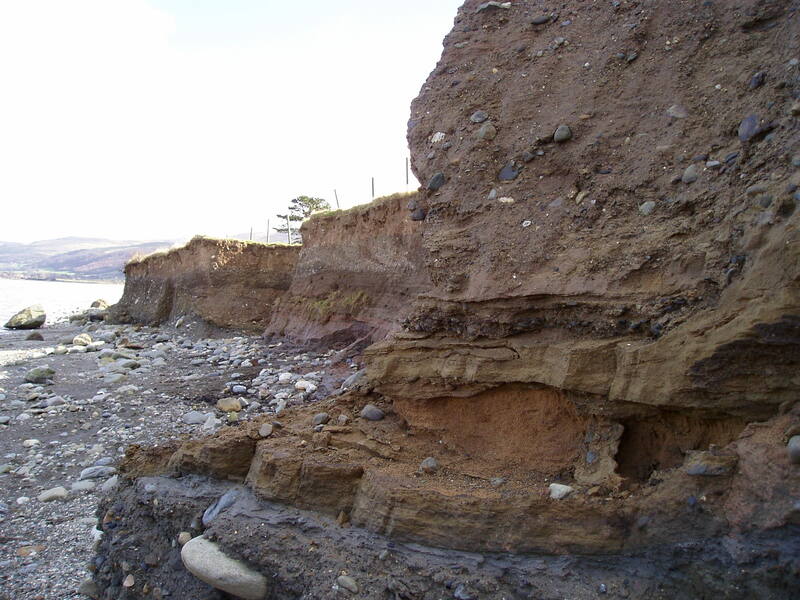 The nature of the deposit tells a geologist how the material has been transported and from where it has come.